Environmental sustainability includes the systems and processes that contribute to the quality of the environment on a long-term basis. In studying sustainability, we seek to understand the factors and practices that make for a greener, more sustainable environment at Rochester, in the region, and around the world. Only in working together—across disciplines, geography, and other boundaries—can we enact global change to solve the problems of sustainability facing Earth. The New Media Fermentation Workshop, a collaboration between University of Rochester professors Leila Nadir (sustainability) and Cary Peppermint (art and art history) meets in Burton Hall March 31, 2014. 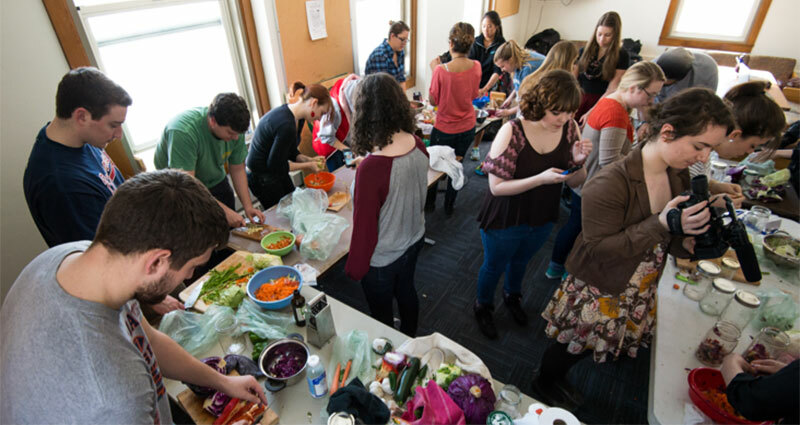 The workshop consisted of students making their own personal vegetable ferments plus new media art students who documented the experience. The workshops were part of EcoArtTech's work-in-progress, Edible Ecologies, which involved collaborating with local communities to resuscitate historic food practices and foodways.